There may be a diesel, just not in the US. Along with an all-new TRD Pro version of the Sequoia, Toyota brought its entire . This included the new 2020 4Runner TRD Pro, which has been updated with Toyota Safety Sense, a new grille to accommodate a radar sensor, push-button start, and two additional USB ports. During a product press conference with Toyota Motor North America Vice President and General Manager Jack Hollis, it was mentioned that the new 4Runner would feature a new instrument panel. If you skip to 15:44 in the video, you will see an image of the new instrument panel, which features a unique redline of just 4,500. The 4Runner is currently only available with one engine, a 4.0-liter V6 that revs to 6,000 rpm. Along with a , we wondered if this lower rpm redline signified a future diesel variant of the 4Runner. We reached out to Toyota for comment and Nancy Hubbell, Senior Manager of Product Communications told us, "there are no plans to offer a diesel 4Runner in the US. We’re tracking down the origin of the photo, but it’s not US-specific." The photo clearly came from somewhere, so perhaps another market will receive a 4Runner with an optional diesel engine. If you watch the video, the picture clearly says "Prototype shown," so the redline could have just been a simple error. 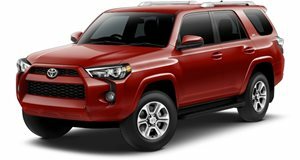 With diesel slowly dying (especially in the US), we aren't surprised to hear that Toyota has no plans to offer a diesel engine in the 4Runner. Would it be cool? Sure. But the 4Runner will continue to be one of the best off-road SUVs on the market, regardless of the lack of a diesel engine. Because you can't really do a top five with the 4Runner. It’s ace off-road, but does that mean the Toyota 4Runner’s compromised on the asphalt?